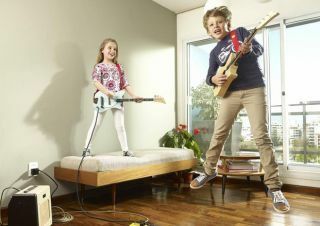 Loog Guitars won the coveted “Best in Show” award during the last edition of Summer NAMM in Nashville. Fender announces two new collections in their Electrics category and an additional colorway to the previously released Johnny Marr Jaguar, just in time for Summer NAMM 2016 in Nashville, TN. It's not the first time that Reverend Guitars and Wildwood Guitars have worked together on an exclusive, but it is the first time that the exclusive involved changing the pickup configuration. PRS and Periphery's Mark Holcomb have worked closely together to develop a truly unique guitar for the SE Series lineup. What Does a Guitarist Do at the NAMM Show? Having never been to NAMM before this year, it always looked like the greatest place on the planet. Supro USA is proud to announce an all-tube tribute to rock guitar icon Keith Richards with the release of the 1600 Supreme. The Fender Custom Shop has announced its new “80 Proof” Blues Junior guitar amp. Ernie Ball Music Man is displaying the JP16, a brand new guitar designed in collaboration with acclaimed guitarist John Petrucci (Dream Theater). Ernie Ball Music Man, is displaying its Caprice and Cutlass Passive Basses at the 2016 Summer NAMM Show.